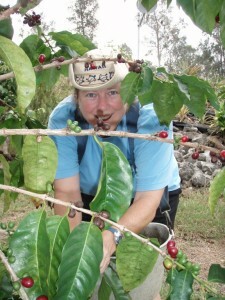 All the Kona Coffee we can drink? Really? And a view to die for? Sign us up!! 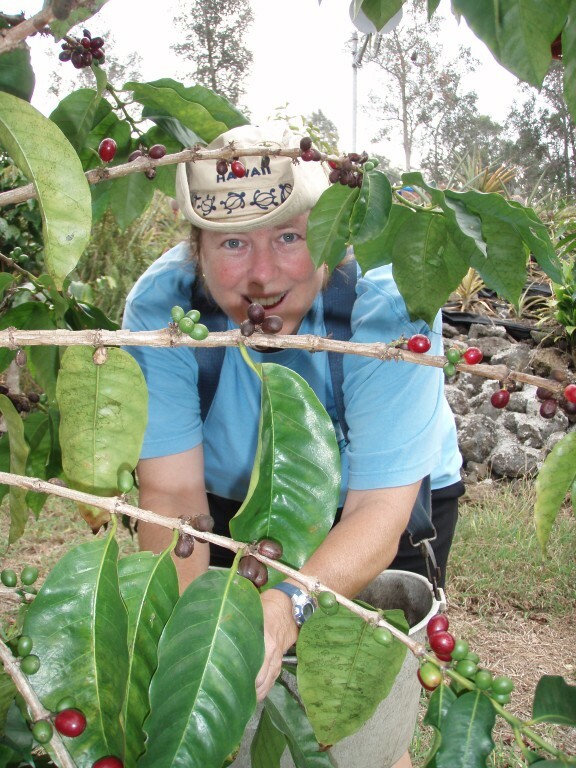 For our 3rd WWOOF experience in Hawaii, we made the quick flight to The Big Island to Lyman Kona Coffee Farm for a first-hand look at organic coffee farming. Working as a farm intern taught us a great deal about what it takes to make a quality cup of coffee. The perfect combination of sunshine, water, fertilizer and helping hands from the WWOOFer world! This was our very own ”B&B” for “Barn & Breakfast”! Once our own breakfast was finished, it was our job to head down the driveway to the Mango Sunset B&B. There we did the breakfast dishes and made sure the rooms gleamed. Fresh flowers for the guest rooms added a nice touch. Whether it was helping out at the bed and breakfast, weed whacking, spreading fertilizer, cleaning the house or picking coffee cherries…there was always a job to be done. We learned so much about coffee and coffee farming during our stay. When the coffee trees are in bloom, it’s said to be “snowing”. The coffee beans are encased in a red skin called the “cherry” – at two beans per cherry. We’ll be heading back to the mainland soon, with new blisters, callouses and sore muscles, but also as WWOOFers with new appreciation for how much effort goes into full-time organic farming, whether it’s growing dragonfruit, lettuce, or Kona Coffee!